Charity aims to raise awareness of vulnerable children. 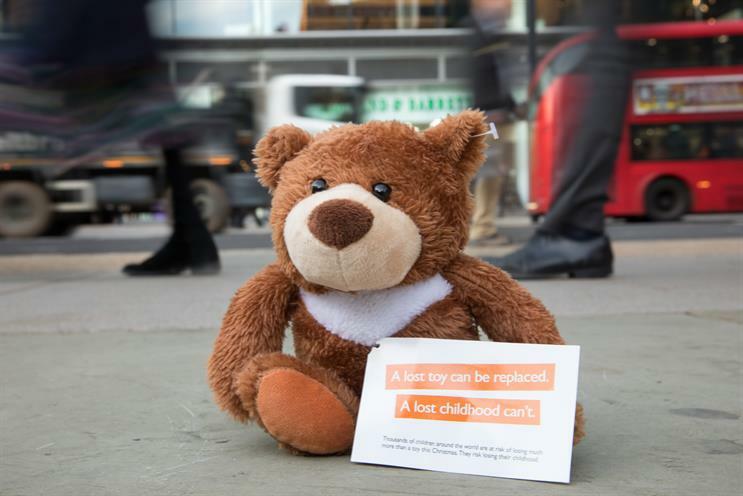 World Vision UK is to place 2,000 "lost" teddy bears on high streets around the UK this week to raise awareness of the dangers that children from poor communities face around the world. The bears are named Hope and have a tag on their wrist that says: "A lost toy can be replaced. A lost childhood can’t." World Vision is encouraging people to share an image of the bears on social media. The campaign, which was created by VCCP, follows research by World Vision that found 45% of UK parents have bought duplicates of their child’s favourite toy in case of loss or damage. Sally Bownes, head of brand marketing at World Vision, said: "This research reveals just how dearly children in the UK value their favourite toy. A lost toy can be replaced, but unfortunately a lost childhood can’t. Childhood is sacred, wherever a child lives. "Hundreds of thousands of children around the world are at risk of losing much more than a toy this Christmas. Many are in danger of becoming enslaved – coerced, forced or tricked into becoming a child labourer, a child soldier or a child bride. "We want people to join us this Christmas in helping make a real and lasting change for a child and their community."